Anti-austerity protesters will stage a ‘pots and pans’ demonstration against any further cuts to public spending laid out in the budget on Wednesday, following revelations Chancellor George Osborne will unveil further tax cuts for the wealthy. “In Britain, we face a crisis that has seen living standards fall father [sic] and for longer than any time since the 19th century. We cannot and must not let this continue,” the group told its Facebook followers. 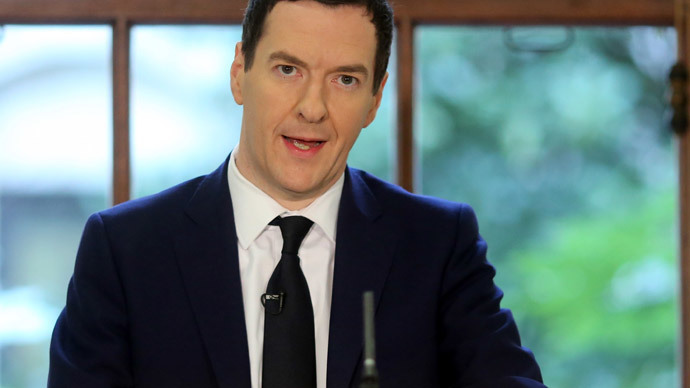 Osborne is expected to rein in the more aggressive elements of his austerity program ahead of May’s general election. However, he expected to introduce a raft of new tax cuts for the wealthy. Conservatives have drawn up plans which would allow parents to give their children property worth up to £1 million without paying any inheritance tax. The proposal document, seen by the Guardian, would also reduce the inheritance tax levels on properties worth up to £2 million. The papers acknowledge that “those already living in the wealthiest fifth of households are most likely to receive an inheritance.” The planned tax break would cost the Treasury £1 billion. It is thought the move will be used as a crowd-pleaser in the run up to the election. Liberal Democrat Business Secretary Vince Cable told the BBC he believed the move was populist, despite it being “human instinct” to want to pass property on to children. “This is an old chestnut that’s wheeled out before every election. If taxes can be cut, and it’s very difficult within the present budget constraint, we’ve got to start at the bottom with people on low pay, not at the top,” he added.